So if any of you are like me, sometimes a need for a new musical addiction arises causing a frantic search of your favorite local music store or the world wide web. My soon-to-be sister-in-law just asked for some recommendations and I shared Lorde with her; but I have thought of some more gems that need to be shared. This is in no way an exhaustive list. I have more musical loves than I want to share in one post. Know that this will not be the last. And please please share some of yours with us! Good things should not go unnoticed. Mikky Ekko: I have always enjoyed this guy on small stages in Nashville but I have enjoyed seeing him in the spotlight a little more lately...you may have seen him on the Grammy stage with Rihanna this year performing their current hit "Stay." Lorde: This girl has got something fantastic going...smart, catchy, wicked awesome. Just listen and try to keep her songs from sticking in your head. Let me know how that goes for ya. Milktooth: My love for this band is about nine years strong...they haven't always been Milktooth but they have always been good. Brooke Waggoner: Also about nine years strong is my love for Mrs. Brooke. Dave, of Milktooth, was nice enough to introduce me to her years ago and it has been a fantastic joy to watch her career over the years but more importantly her art-form develop. Laurie and I both adore the work of this lovely lady. If you have heard any of Jack White's recent releases you have heard Brooke. Shovels and Rope: I love the raw country/rock that these guys and other friends of mine are perfecting these days. Thanks to my equally talented friend The Kernal, you have to listen to him, I now know about this duo that seems to be growing in popularity lately. As much as I want to keep going and tell you to listen to more people like my ever-talented friends of The Young International or Daniel Ellsworth & The Great Lakes (Dan introduced me to Lorde via that online book of faces) or my sweet friend Alice Calvery; I know I must stop. I don't want to overwhelm you for fear that you will not listen to any of these. And you must listen to all of these. Just once at least. Then let me know if there are bands you know that I must know. This is how this whole world wide web works. Share the wealth of knowledge people! A little Shovels and Rope - I love this. So fun. Mrs. Brooke. Love this tune. This is a fantastic Milktooth project. You may also notice a certain Daniel Ellsworth among some other fantastic musicians. Those last moments of summer are upon us. It makes me somewhat sad that I didn't spend nearly enough time next to a body of water, but these few cool Nashville mornings have me craving the crunch of leaves, apples and the smell of firewood. I don't want to wish away these last summer moments so I am embracing the freshness of everything and the glow of the sunshine. As of late, my husband and I have been obsessively drinking La Croix sparkling water. We each bought some on Wednesday without the other knowing and right now, four flavors are in our house (lime, orange, cran-raspberry, coconut). I even explored their website. A website for water. Yes I did. However, I am glad because I ran across their summer drink ideas! 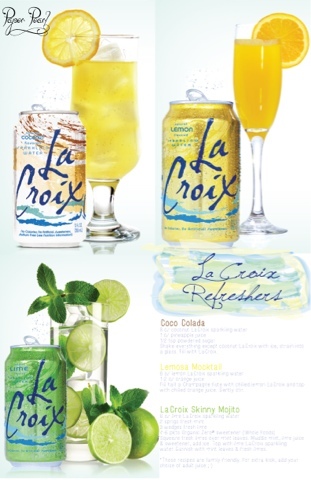 Check out lacroixwater.com for more. I picked my favorite ideas.